Our collecting of computer memorabilia first started out in 1996 during the hey-day of the IBM Personal Computer & something relatively new to the public called "The Internet". This was an amazing time when corporate advertising & promotional budgets were virtually unlimited, tech companies were enjoying extremely strong growth and each quarter brought on record earnings for many. Intel's Pentium "Intel Inside" campaign was in full force and the company was preparing to launch the Pentium II BunnyPeople campaign. 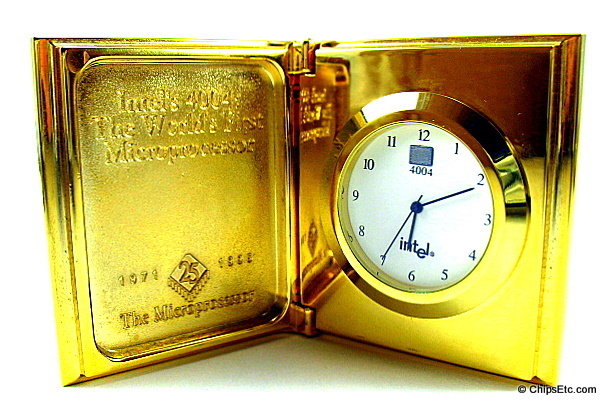 Promotional items of all types were abundantly available. In 1996 AOL was the choice for Internet Connectivity, Microsoft had just released it's Windows 95 operating system, Netscape navigator was the browser of choice, and Yahoo was "The" search engine. Years later, in 2009, our collection of collectible items had grown to over 400 High-Tech memorabilia items. We decided it was time to start the process of photographing and cataloging our collection,and to create the ChipsEtc.com web site. 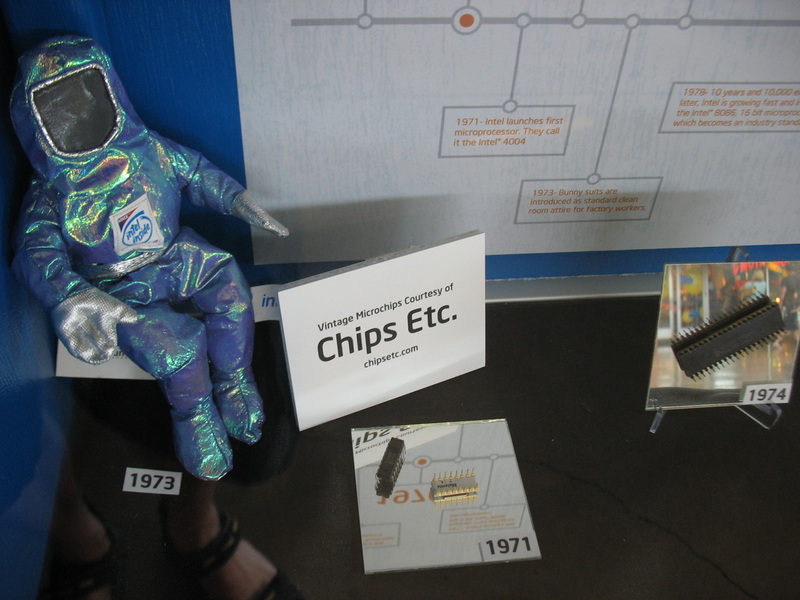 Our goal was to showcase the exciting Evolution of Computer & Microprocessor Technology that has taken place over the last century using the memorabilia items found in our collection. 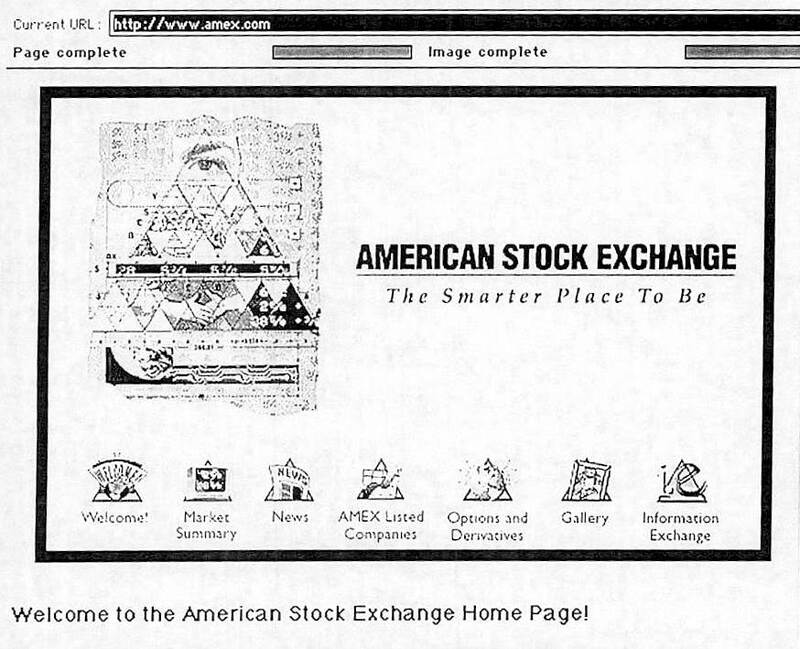 ChipsEtc.com was launched on 01/01/2010 with over 500 memorabilia items. We choose to group the items in our collection based on the company they promote. All items in the collection are displayed with their image, date of release, as well as historical background information. Our collection is an ongoing effort that will continue to grow over time, so please check back often. Our specialty is Collecting computer chips, & promotional Lucite Paperweights, Jewelry & Keychains made with real Computer Chips embedded inside. In November 2012, Collectors Weekly - a website for collectors and antique enthusiasts, selected Chips Etc. 's collection of Vintage Collectible Computer items for introduction into its Best of the Web - Hall of Fame. 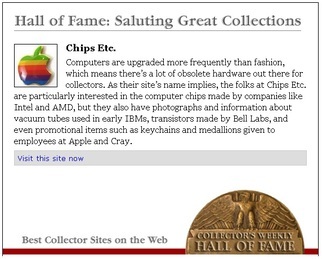 Their Hall of Fame showcases the best antique and vintage collectors reference sites on the web.